In the recent news, a 58-year old man was sentenced to serve a total of six years’ jail time for abducting and molesting a 7-year old girl. The accused happened to be the neighbour’s victim who had been picturing himself molesting the little girl for two months before he lured and almost raped her. For parents like us, this is something that totally outrages us. As they say, knowledge is power and knowing what to do to safeguard our kids will empower not only our kids but our whole family. AHA! Parenting did well in discussing tips that every parent should know to keep our child from sexual abuse. Most parents worry about how to protect their children in a world that sometimes seems so dangerous. As with any other danger, protecting our kids from risk starts with understanding those risks. For instance, parents often think a discussion about “stranger danger” is sufficient to protect kids from sexual abuse, but most children are molested by someone they know: babysitters, relatives, even another child. 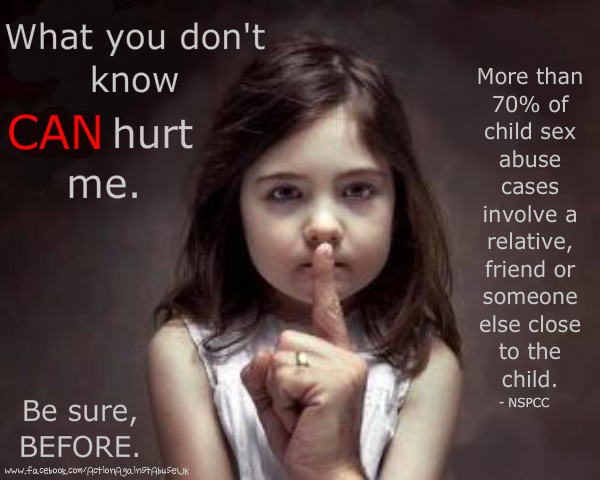 Sexual abuse is a risk for every child. Many researchers estimate that one out of four girls and one out of six boys will encounter unwanted sexual touching of some sort before age 18. Add a couple of the books in the list below to your child’s bookshelf and read them periodically. Use them as a jumping off point to ask questions to reinforce the message. Teach children the correct terms for their body parts as soon as they can talk. If a child is touched inappropriately, they need to be able to clearly communicate to you or anyone else in authority about what happened. The correct name also lessens shame around sexuality. Can you imagine if your knee was just referred to as “down there”? 8. Encourage your children to tell you about things that happen to them that make them feel scared, sad or uncomfortable. 9. Explicitly discuss with your child that you would never be angry or hold them responsible if someone touches them inappropriately. When predators groom kids, they tell the child that the parent will punish or stop loving them, if the parent is told about the sexual activity. The child will do anything to keep you from knowing about this, because it is better to suffer the abuse than to lose your love. When you read books to your child, discuss the story from the child and parent’s perspective. Ask how a child feels who has been inappropriately touched. Do they want to tell their parent? Will they? What are they afraid of? How will the parent react? Whose responsibility is it? Will the parent ever blame the child? This is an important discussion to have with kids more than once so they know that you would never blame them. 10. Never force children to hug anyone, even relatives. 11. Don’t leave your child with anyone, even your boyfriend, unless you completely trust him. The good and bad news about abuse is that most of it, statistically, is not perpetrated by strangers. It happens at the hands of family members or the mother’s boyfriend. Almost all the rest is perpetrated by trusted intimates such as coaches, religious leaders or teachers. Bad news? Yes, these are people your child trusts. But it’s good news because it is a risk you can usually avoid, if you trust your instincts and pay attention to your child. This is just one of the many reasons that stepparents should never have the responsibility of disciplining their partner’s children. MSF places victims under a care programme to help them cope with the trauma. In some cases, this involves placing children into Childrenâ€™s Homes or under foster care.